involved spinal manipulation and traction on a table called a scamnum. To this day, many physical therapists use similar ways of relieving neck and back pain. Hippocrates used another mode of treatment that involved strapping the patient to a ladder, hoisting the ladder and the attached patient into the air, and then dropping the patient from that large height. Interestingly enough, there is also a Biblical story in Luke 13 in which Jesus heals a woman who was “bent over and could not straighten up at all,” an obvious case of kyphosis (humpback). Treatment continued to improve in days of the Renaissance when Ambroise Pare became the first to treat scoliosis with a brace. In 1741, pediatrician Nicholas Andry publishedOrthopaedia, a medical handbook for raising healthy children, a type of Correcting and Preventing Deformities in Children for Dummies or something. In this book, he described his methods of scoliosis treatment which included rest, suspension, postural approaches, and padded corsets. It was in 1839 that Jules Guerin became the first to use subcutaneous tenotomy and myotomy as a way to surgically treat scoliosis. The use of the plaster jacket was popularized by Lewis Sayre in the mid-1800s. Entering the 20th century, we saw the advent of the first spinal fusion in 1911 by Fred Albee and the first surgical scoliosis technique involving metal implants in 1920 by Wreden. Scoliosis surgery became more and more popular over the next decades. 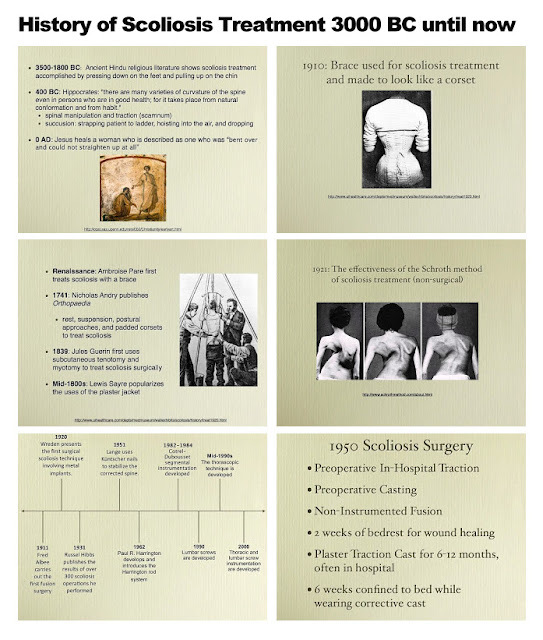 In 1931, Russel Hibbs published the results of over 300 scoliosis operations he performed. Twenty years later, Küntscher nails were first surgically implanted as a way to stabilize the spine. Surgery’s popularity resulted in a demand for safer and more effective instrumentation. Paul R. Harrington developed the Harrington rod system in 1962. Many people today still have these Harrington rods in their backs. (For those who do, make sure you watch out for flatback syndrome!) The Cotrel-Dubousset (CD) segmental hook instrumentation was developed from 1982-1984 while lumbar screws were used for scoliosis beginning in late 1980’s. Then, in the mid-1990s, the thorascopic technique was developed, and, during the past 5-10 years, posterior thoracic and lumbar pedicle screw instrumentation has become the gold standard for spinal deformity treatment, both in children and adults. To this day, researchers, engineers, and doctors like Dr. Hey continue to develop and test even better instrumentation and surgical techniques. Who knows what the future will hold for scoliosis patients?